A variety of activities will take place on the Missouri Southern State University campus during the “Greatest Place on Turf” Homecoming 2017 celebration, set for the week of September 25. The week will include campus contests, the annual picnic and parade, and will culminate with the Homecoming game with University of Nebraska-Kearney at 3 p.m. on Saturday, Sept. 30. All day: Homecoming royalty elections. 10:30 a.m.: Campus picnic on the Oval. Free for faculty/staff and students, $8 for public. Pep rally, announcement of flag and departmental contest winners. Noon: Crowning of Homecoming royalty on the Oval. 6 p.m.: Alumni Award social, followed by 7 p.m. dinner in North End Zone facility. Tickets are $15. RSVP by calling 417-659-5466 no later than Tuesday, Sept. 26. 11:30 a.m.: Homecoming parade through campus. 12:30 p.m.: Alumni tailgate at the Ralph L. Gray Alumni Center. Open to MSSU alumni and families. 3 p.m.: Football kickoff vs. University of Nebraska-Kearney, Fred G. Hughes Stadium. Reduced price tickets available through the Office of Alumni and Constituent Relations. 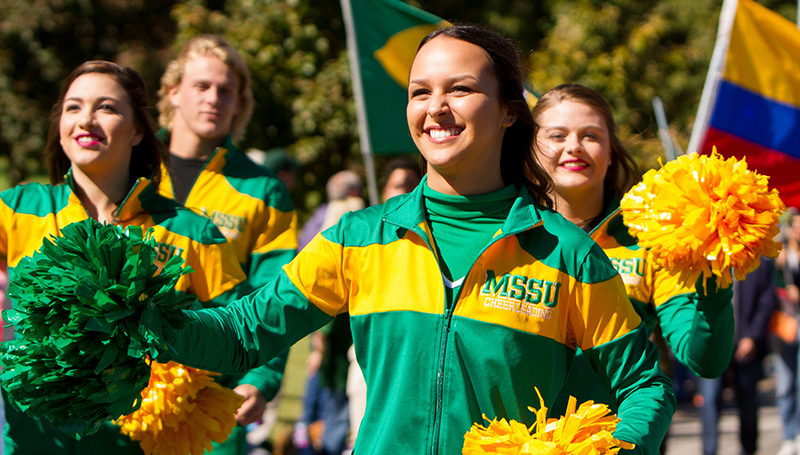 For game day tickets, visit mssu.edu/homecoming and use the coupon code ALUM2017. 3 p.m.: Basketball reunion – 1978 and 1993 teams, Fred G. Hughes Stadium. 6 p.m.: Chart Hall of Fame Reunion. 6 p.m., Connor Ballroom, Billingsly Student Center. $20. To RSVP to the Basketball and Chart reunions, contact Office of Alumni and Constituent Relations no later than Tuesday, Sept. 26 by visiting mssu.edu/alumni/homecoming or calling 417-659-5466. For more information, contact the Student Activities Office at 417-625-9699 or the University Relations & Marketing Office at 417-625-9399.